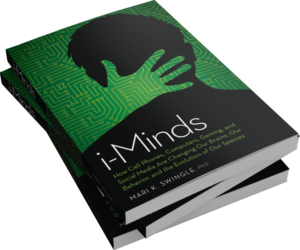 i-Minds (1st Edition): How Cell Phones, Computers, Gaming and Social Media are Changing Our Brains, Our Behavior, and the Evolution of Our Species. (240 pages, New Society Press c2014-2016). [劫持 / Jiéchí (HiJack). Chinese Edition. (307 pages c2018 CITIC Press China). I-Minds (2nd Edition): How and Why Constant Connectivity is Rewiring Our Brains and What to Do About it. (540 pages, New Society Press c2019). children and families, friends and lovers, work and learning, development and brain function as influenced by our ever changing world and the technologies within. In this exploration, Dr. Mari paints a picture of change, giving food for thought on what we should embrace and accept, what we should unequivocally reject, and many aspects of the digital era that are timely to debate. The topic of i-tech influence is trending, carried by popular magazines (e.g., New Scientist), newspapers (e.g., New York Times), radio & television news, and documentaries (e.g., CBC, CNN & BBC) and let’s not forget online…everywhere online too The timing is right, the emergent debate hot, fueled by opposing fractions often along generational or occupational divides. Digital Immigrants versus Digital Natives, gamers versus non-gamers, educators versus entertainers all supported by varied voices of authorities, vested interests, and naïve audiences (e.g., scientists, scholars, the gaming and communications industry, parents and politicians). Arguments are also frequently along said divides; fractions staunchly holding strong to perspectives that the older had better get with the times or the younger are getting progressively stupid. –Of Utopians versus Luddites and Dystopians. But by spending our time on the argument we are all missing the point. We are not listening to what science is clearly showing us –and what all sides (pro and con alike) are saying. What all sides are saying is interactive screen-based technology is very, very powerful. I say we should stop arguing and examine this power. Examine it closely … and wisely. With knowledge comes choice. –And informed choice is true power which can bring true advancement for all. There is far too much socialization, emotional regulation, heck everything being learned and hardwired in the very young years, and kids under six are absolute sponges; you want them to relate to you and absorb what you teach, not what i-tech and media do. Development: We are all are noticing changes, the young, the old, professionals and lay people alike. Sometimes simple things, surface shifts, what those over 40 now perceive as a shallowness of information; a subtle lack of depth and length of conversation, of attention, a staccato of sorts, as opposed to a melody in personal interaction. Some are more threatening, such as a perceived dramatic increase in infidelity, the death of intimacy, and the reduced strength of pair bonding driven by the ease of access of the digital age. Others go a little more to the core, how children are starting to attach more to i-tech than people, are losing touch with real physical and emotional boundaries, are often agitated and aimless when not on i-tech, and have troubles communicating without a digital mediator. How innovation and creativity are declining as we now turn to i-tech when bored, losing the blank space, the void that leads to states of observation and contemplation from which all invention and expansion sparks. How attachment and socio-emotional development in the young and processing in the older are being rewired, thwarted. How in our busy, busy world we just can’t seem to disconnect and are revving at arousal levels unprecedented, reflected in childhood rates of ADHD and adult rates of insomnia, depression and anxiety, now clearly also visible in my own brain research (electroencephalography or brain mapping). These are a few of the topics that my book, i-Minds addresses. But, in difference to others, I focus less on the ‘what’ and more on the ‘how’ and ‘why’ we are using i-tech and what it is doing to our neurophysiology, to our brains. I explore our relative levels of immersion and the use of the medium to the inclusion or exclusion of other activities or relationships. I introduce the concept of Integration versus Interference, epigenetic influence, and how some of us have most healthy relationships with people and technologies alike, while others suffer rather extreme fallout from over consumption or other misapplications to, or maladapatations from i-tech. I illustrate how i-tech is influencing our thinking and our processing; our functioning as a whole. I look at micro-cultures, such as high school and bullying, parenting circles, and dating, as well as shifts in macro-culture affecting work, sexuality, mental health, learning, education, play, creative process, politics, governance, and law, attachment and development itself; in sum all that makes a society or a culture. Weaving through hard science and research, popular literature, media and industry hype, history, sociology and social psychology, personal observations and tales from over 20 years of clinical practice and clinical research on i-tech, media, children, learning and behavioral disorders and families, I deconstruct and dissect arguments often confusing for the lay person. My objective is to paint a more complete picture of our era, to arm interested individuals with informed choice; to give food for thought on what we should embrace and accept, what we should unequivocally reject, and many aspects of the digital era that are timely to debate.